Since his first onscreen appearance, Batman has inspired some terrific musical scores–so much so that even the ultra-’90s Batman Beyond theme is surprisingly rad. 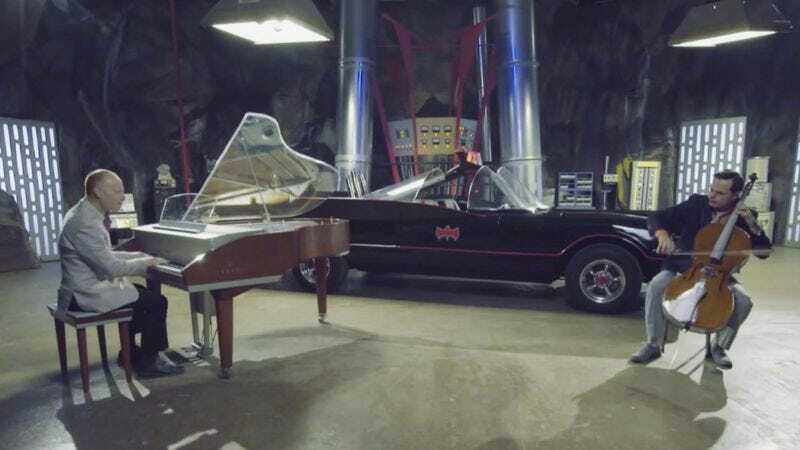 In this video, “Batman Evolution,” ThePianoGuys play through three distinct eras of The Bat, from Neal Hefti’s 1966 theme to Danny Elfman’s 1989 take and Hans Zimmer’s 2008 version, before culminating in an arrangement of all three. The video also brings together three sets (and Batmobiles) from each era and includes nice little touches like the aspect ratio changing to reflect the formats of each version of Batman. Heard side-by-side, it’s notable that despite Christopher Nolan’s Dark Knight Trilogy being the most critically lauded of the three Batman properties featured, Hans Zimmer’s piece of the action is the least memorable of the bunch. Maybe that’s simply because Zimmer’s score hasn’t had the time to sink its nostalgic hooks in, but it’s hard to not come away with the impression that his version settles for a generic “epic” vibe that wouldn’t be out of place in a luxury car commercial. On the other hand, the Batmobile is nothing if not a kind of luxury car (albeit the kind a Columbian drug lord might own), so maybe that’s not so off-base, after all.